Now that you've completed your pattern and it tells you to Finish (or Fasten) off, what do you do? Of course, there are now those silly little strings left from where you snipped everything, and you need to work those into the piece. This is called Weaving in the Ends. There are a couple different ways to do it, if you are joining pieces together, you can either use the ends to join (if you left them long enough) or you can hide the ends under your seams, or you can just use a yarn needle to hide those ends into the piece. 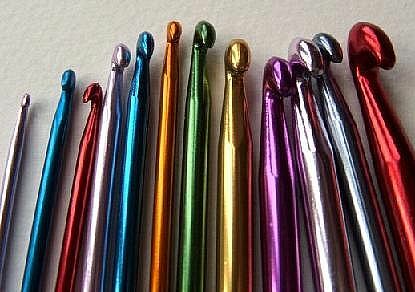 Here are a couple of links on how to use a yarn needle to hide your ends. Now lets say that you are working on a larger piece, where you have multiple pieces to fasten together. You're going to want to figure out what style is best for you to get the appearance that you would like. Each method produces a varying look that will depend on your color of yarn, and how the pieces are joined together. There are some ways of joining that create a nice pattern between the motifs, and others that are meant to be hidden. It's all just a matter of personal preference and how you would like the pieces to join together. I've included links to all of the varying methods that I know of, and they all include pictures of how the stitches will look when worked together. I'm sure that if you play around, you can find one that you like! Do you remember those gauges that you made (or that I hope you made) a couple tutorials ago? This would be a good thing to practice with these squares. Take each one and join them with a different type of joining and see which ones you like and which ones you don't! It also makes a great reference if you label each seam with which style that you did, and then in the future, you can reference it to see which one you like for the project you are currently working on!